2010 and 2011 saw some strong performances in house prices in France and in sales numbers. In 2010, sales increased by 2% and by 7.3% in 2011. This had the welcome effect of bringing the market back to a stable footing, following the price falls and decrease in numbers of property sales of the preceding years. The sale of French property peaked in 2007. The property market in France is always more level than in Britain and Spain, largely thanks to the tighter lending controls. French mortgages are only given for up to 80% of the property value, and usually represent not more than 33% of your total income. Proof of a stable income and ability to repay the loan is vital. France, and French property, presents as ever a lower risk factor which keeps buyers and investors interested. France in 2012 is, to some extent at least, a buyer's market, which is great news for anyone looking to buy French property this year. The artificially inflated prices of 2007 are slowly disappearing, leaving many excellent properties for sale at more affordable costs. In fact, in many regions there are some real bargains to be had. Village properties are selling well, perhaps because of the generally lower price range (from around 40,000 Euros to 250,000 Euros). Properties needing total renovation are becoming less sought after, but part renovated properties which are habitable though in need of some finishing, still sell well. As long as the price is realistic and reflects the work to be done (House Renovations in France). And luxury and high end properties in sought after locations like the Riviera are still selling. The French president, Nicholas Sarkozy, has recently announced changes (actionable from January 2012) that will have an effect on the property market in France. By removing the need for planning permission to extend existing property by up to 30%, and by selling off some state owned land for building, he hopes to create more housing and further stabilise prices. 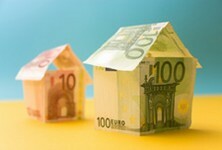 So, 2012 looks set to be a relatively stable year for French property. The message to sellers is: "Get real about prices. If you price your property right, it will sell." Yes, there is likely to be a reduction in prices overall, but as long as this keeps the market moving nothing too disastrous should happen. And bargain hunters should enjoy an excellent year! There has rarely been a better time to invest in French property.